Ten white plastic chairs are arranged in a circle on the roof terrace of a four-storey apartment block housing hundreds of Asian labourers. This is a part of Qatar where tourists never come – Doha’s Industrial Zone, where all the hard groundwork is done to maintain Qatar’s image as a modern state. The roads here in some areas are bad, there are no streetlights, and the air is filled with fumes. Although it is officially illegal to meet outside of government-approved areas*, tonight a group of Christians will meet here together to read the Bible and pray. Most visitors will see only grand, extravagant palaces, brightly illuminated skyscrapers and futuristically designed mosques in Doha, the capital. 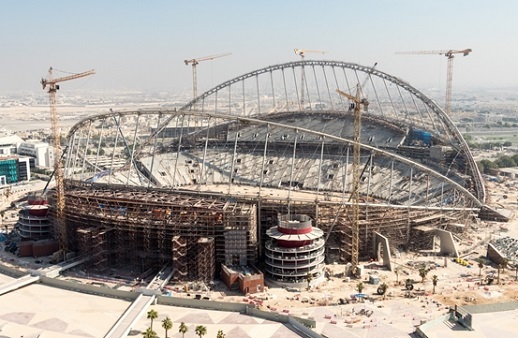 Within a few years, a dozen new architectural accomplishments are going to join those landmark buildings – state-of-the-art football stadiums for the 2022 FIFA World Cup, which are said to be costing the country $500m a week. Billions of eyes will watch the football matches in Qatar. The country is determined to make a good impression – to look like a modern, glamorous, successful country that is welcoming to everyone who is willing to spend money and have a good time. Qatar seems determined to compete with Dubai as a worldwide hub for business, entertainment, shopping, travel and design. “All the efforts and resources in the country are now focused on making 2022 a success,” says Simon, a Sri Lankan who came to Qatar as a Buddhist but who now calls himself a Christian. Simon is currently working as a maintenance supervisor for a series of football-related construction projects. But the FIFA PR show cannot hide the other side of Qatar – a profoundly intolerant country for non-Muslims. There is a deep division between the extremely rich Qatari nationals, who are now a tiny minority in their own country, and the hundreds of thousands of often exploited labourers, mostly from Asian countries. Reports from charities such as Open Doors (which works with Christians under pressure globally) suggest there are serious dangers for those not part of Qatar’s Muslim elite. Qatar is ranked 20th on Open Doors’ 2017 World Watch List of the 50 countries in which it is most difficult to be a Christian. “In this Muslim country, we are limited in evangelising too openly,” says another Christian migrant, Samuel. “But nobody can stop us from talking to our fellow workers and witnessing to them in our everyday lives. Every day God gives us opportunities to show His love to others. Simon says the situation for labourers has improved over the past few years but that “they still suffer, especially in summer when temperatures easily reach over 50 degrees Celsius, and they still have to work their 11-hour shifts. A typical worker makes just above $ 400 US a month but also receives bed and board. Many workers live with five others in cramped rooms. 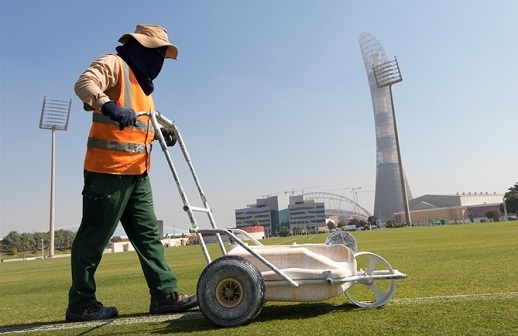 Simon says the salaries the labourers are paid are often lower than promised before they migrated to Qatar from countries such as India, Nepal and the Philippines. Some contracts, either by middlemen in their own country or in Qatar itself, can be fraudulent and involve fake documents. Most contracts only allow them to return home to visit their families after a full two-year work period. Many employers hold their employees’ passports, though this is illegal as per Qatar’s labour law. “On top of that, we see that some bosses treat their employees with horrible disrespect,” Simon says. He says he hopes a new labour law, allowing employees to freely change their jobs or employer after completing a two-year contract, will improve their situation. *Qatar has an officially-designated Religious Complex for Catholics, Copts, Anglicans and various other Christian organisations and groups. Here they can meet freely for prayer, worship and fellowship. The site, around 10km outside Doha, is guarded by Qatar internal security.